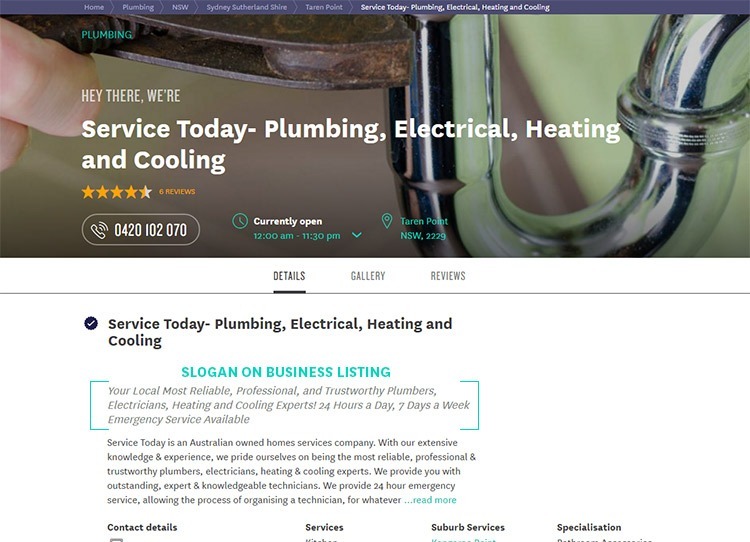 An excellent business listing on True Local with a slogan, description, images and reviews can get your listing up to 7 times more views, helps your company establish a web presence and can even generate more business. Think of your slogan as a prime opportunity to capture the customer’s attention. On True Local your slogan features prominently in our search results and on your business listing, so it’s the perfect way to give potential customers a snapshot of your business and encourage a click to find out more. Handy Tip: Use your slogan to cleverly implement keywords about your business. This helps Google easily identify what your page is about and could help your listing rank higher in search results. Handy Tip: When using keywords in your slogan make sure they are used in sentences that read naturally. Use your business description to elaborate on your slogan and invite customers to find out more about the products and services you offer. Tell us what your company does in the first sentence. Outline the services you provide and the areas you cover. Describe your business using words such as reliable, knowledgeable, efficient, friendly and thorough to help give your business personality and connect with the customer on a personal level. Include a call to action like “call us today for a free quote” to help convert potential customers into paying ones. Give your business some cred and list some qualifications, awards, or recognition your business has received.